We live in a fast evolving tech world where human lifestyles have transformed rapidly. The way we managed our daily tasks today is totally different from the manner we used a few years ago. There is no business today without a website or online presence. Having a website or your mobile application has become a necessity in order to attain a strong customer base. And once you have set up a website, doesn't mean your job simply ends here. You have a lot more things on your task list! Why website monitoring is necessary? Once you have set up your business website, you need to make sure if your website is safe from the malicious attacks and hackers or not. And if your website is dealing with the customers account details and other personal information, it becomes your prime role to safeguard their information at every cost. Moreover, you need to offer fast and quick services whenever the user is visiting your website because slow websites never attract customers. So, having a safe website which has good performance results is a must to stay up to date in the industry. There are many other things about your website which you might be unaware of. 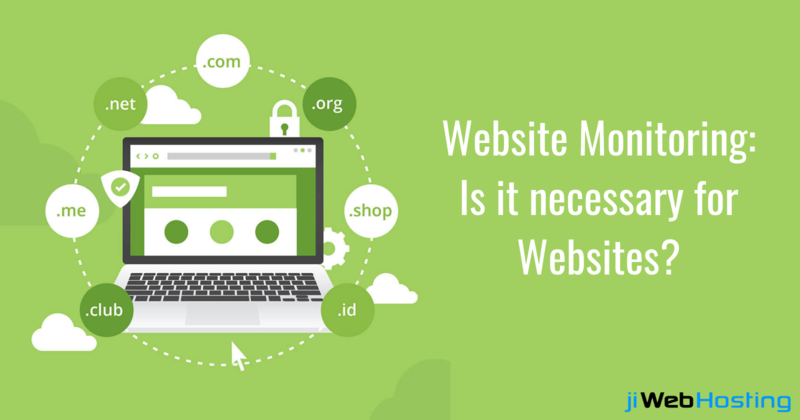 For example, about the downtimes, how much time the website has stayed offline, loading speed, and other performance issues need to be monitored regularly in order to attain website stability. Otherwise, be prepared to face the consequences. Maintain your brand image & online reputation: Whether yours is a software development business or an online shopping website, if your website has frequent downtimes or pages take time while loading, it will directly affect your brand image. To avoid these downtimes, you need to regularly monitor your website and find suitable solutions to over this. Maintaining happy customers: If your website has slower loading speed, you will surely keep on losing the customers. In this fast tech world, nobody has enough time to wait for your website to load, rather they will switch to another website and never turn back to your website. So, you need to monitor it and rectify the reasons behind the slow speed and falling performance of your website. Detecting hackers: Hackers could be one of the possible reasons behind the website downtimes and low performance. So, if your website is working slow, you must not neglect it. You need to immediately look for a reliable web hosting provider and get your website hosted and monitored from them in order to stay away from the hackers. Analyze the real stats: Having an appealing website is just not enough if you don't have a good customer engagement. You must get the real-time stats about how many customers are visiting your website, how many of them are liking the services and leaving a good review, how many customer complaints have you encountered and a lot more. Get best search results ranking: If your website is facing frequent downtimes, it might affect your search results in Google. Bad downtimes and slow website speed result in affecting your search ranking. Get alerts when the website goes offline: Whether your website is going down due to some technical fault, or due to greater traffic, you need to aware of the time whenever the site is going down. This helps you in getting a better idea about all the aspects of the website that needs improvement. When we talk about the customer data, we simply can't compromise on their security. A little carelessness can end up in losing the customer's trust in your brand, and this might result in huge losses of your business. So, be aware and stay updated about the top website hosting trends and stay on the safer side. Have any queries? Feel free to get in touch with us.